Begin on all fours with your arms extended straight in front of you. Then, sit back on your heels while keeping your arms straight out. Hold for 30 seconds to a minute and repeat. A good lower backstretch, this pose is accomplished by starting on your hands and knees with your hands slightly in front of your shoulders. Raise your knees off the floor and lift your tailbone toward the ceiling to stretch the large muscles in your lower back. 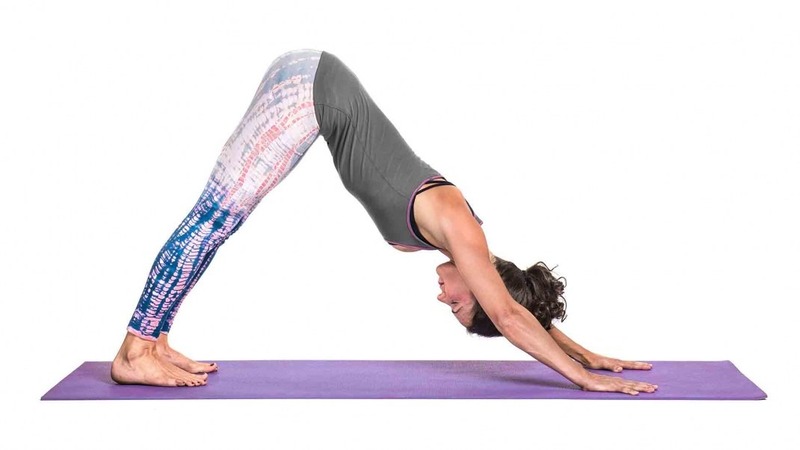 Start on all fours on the ground then slowly arch your back to move into the cat pose. After a few seconds, press your shoulder blades back and lift your head to create the cow pose. Repeat as needed. But Let’s go more specifically now…. HERNIATED DISC… What to do? One of the most common disease of the spine is Herniated Disc and it can be a very painful condition. It identifies damage to the intervertebral disc. The disc undergoes a movement that can cause irritation of the neighboring nerves, with the consequent appearance of back pain and sciatica. The herniated disc can be lumbar, cervical or dorsal. Generally in the case of pain in the treatment of herniated disc inflammation, drugs such as cortisone, painkillers and anti-inflammatories are used. If there is strong inflammation, rest is recommended, but as soon as you feel better, Yoga can be a wonderful healing tool. Yoga in particular hatayoga, through the static and dynamic Asanas, helps the spine to be flexible and to find the right posture, as well as strengthening the muscles, tendons and connected nerves. This Asana is recommended for those with herniated disc problems, stiff neck and curved profile. Those suffering from these disorders can also sleep in this position to find benefits. It relaxes the whole body like in Shavasana. So called as it is the best pose for relaxing spine. Lie on the tummy with the legs a bit apart. Turn the toes in towards each other and let heels fall out to sides. Interlock the fingers at the back of the head, either at the back of neck, or the back of the skull. Turn the face to one side if that is more comfortable. Half way through rest turn the head to the other side. Elbows and arms are completely relaxed. Let the body sink into complete softness and allow the effects of the practices to settle in the body. Stay as long as you need and confortable! But now coming the Highlight of this Topic…. 1 MINUTE AND A HALF OF YOGA AND STRAIGHTEN YOUR BACK. Back or spine problems, such as scoliosis, can be reduced with only one and a half minutes per day of yoga. The beneficial effect, practically immediate, was observed following a study published in Global Advances in Health and Medicine and conducted by a team of researchers, including Dr. Loren Fishman of the Columbia University College of Physicians and Surgeons of New York. “VASISTHASANA” (Side Plank Pose) in 25 patients with idiopathic or degenerative scoliosis. Based on the analysis, it was established that patients had a primary curve of 6 to 120 degrees. After recruitment and selection, researchers taught patients how to take posture and maintain it for 10-20 seconds a day during the first week. After that, the participants were asked to maintain the position for as long as possible, once a day. The posture, moreover, had to be maintained only on the convex side, that is the weaker side of their vertebral column. The final results showed that with an average of only 1.5 minutes per day, six days a week from two to twenty-two months, the yoga posture taken in the study reduces the curves of idiopathic scoliosis from 32% to 49.2% in both adolescents and adults. The originality of the study lies in having adopted a posture that acts asymmetrically – as is the condition of scoliosis. The dott. Fishman notes that the National Scoliosis Foundation (NSF) recommends as many as 25 yoga postures to treat scoliosis, but does not provide asymmetric exercise. The adoption of complicated, tiring and long-lasting exercises puts a strain on patients’ patience and constancy, emphasizes the expert, so it may be that many leave the treatments, with the risk that scoliosis progresses. According to Fishman, untreated scoliosis can progress by 7% per year and cause disability and dangerous health risks. “Since scoliosis is an asymmetric condition, I treated it asymmetrically – explains Fishman in the press release – asking patients to take the pose only on the weaker side. This reinforces the specific spinal muscles on the convex side that are necessary to help in reducing the curvature of the vertebral column”.